Unlike many of the Bauhaus photographers who trained in design or architecture, Mantz trained as a photographer from 1920 to 1921 at the Bavarian State Academy for Photography in Munich. He then returned to Cologne to set up his own studio specialising in architectural subjects. He was commissioned by architects such as Riphan, Nocher, Grod and Schumacher and by the City of Cologne. Although the clarity of form and design suggest associations with the Bauhaus, he was completely independent from that circle of artists. In 1932 he opened a studio in Maastricht in the Netherlands and he finally settled there in 1938. The geometric clarity of his photographs is in part attributable to the clear style of the architects he worked for in his formative years. Their spare geometric designs demanded a response in kind. The aesthetic quality of these photographs transcends their usefulness as architectural documentation, making him an exemplary precursor to the formal architectural photography associated with the pupils of Bernd and Hilla Becher in the 1980s and 1990s. ‘Glaspaleis’ shows the Schunck department store. It has been photographed on an angle that brings out the raised corner of the building’s elevation while the open cubic spaces on the façade are emphasised by strong use of light and shadow. 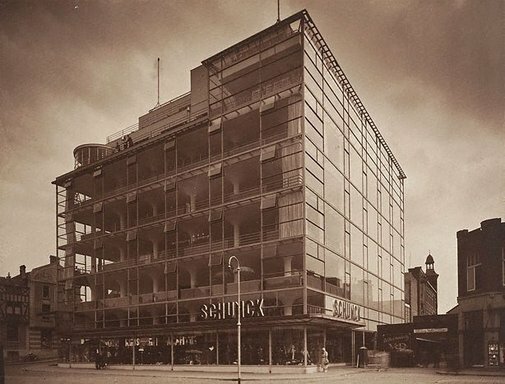 When Mantz finally left Germany to settle in the Netherlands, German architecture had already lost its momentum due to the uncertainty surrounding the rise of National Socialism with its preference for a more nostalgic design ethos. Perhaps the moment for Mantz’s great architectural themes had passed, but in any case in the Netherlands he turned his attention to portrait photography and in particular to images of children. Signed u.l. verso, pencil "W. Mantz". Dated verso pencil "...1934". Anthony Bond, Photography: Art Gallery of New South Wales Collection , 'International modernism', pg.93-111, Sydney, 2007, 110 (illus.). Bruce James, Art Gallery of New South Wales handbook , 'Western Collection: Photography', pg. 93-99, Sydney, 1999, 95 (illus. ).